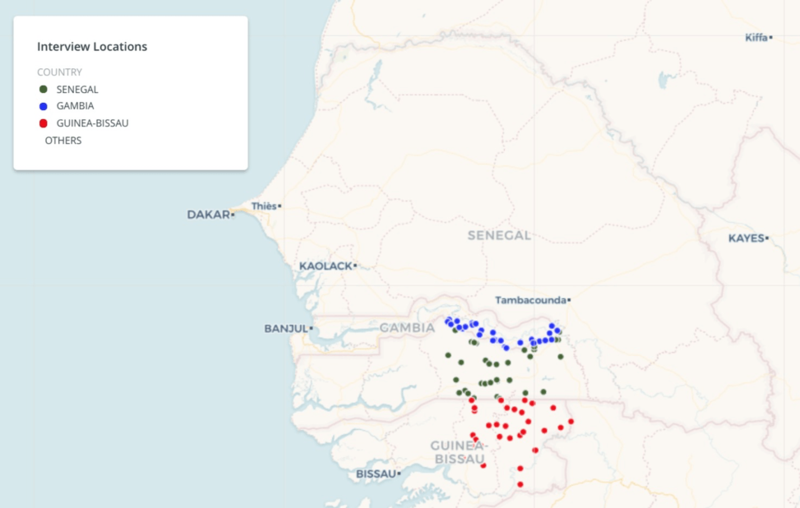 My research focuses on a particular borderland split between four West African countries: Senegal, Gambia, Guinea-Bissau, and Guinea. Since the late 19th century, people in this borderland have moved between countries for a variety of reasons and in multiple directions. I plan to use my CHI Fellowship to map some of these movements. For some of these locations, this is not a major issue. I was able to collect geographic coordinates for the 110 villages, towns, and cities in which I interviewed people during my fieldwork in 2016 and 2017 (see the below map for the sites of my interviews). However, the problem becomes in tracking where these people came from. Some people discussed their own migration from villages that may no longer exist, or are in different locations from where they had previously been. Additionally, there are often several villages or towns with the same name, particularly when the name has religious meaning. In other cases, villages have multiple names, and so the officially recorded name in government documents may not line up with the information I was given. Other people I spoke with discussed the migration of their parents or grandparents, and only knew the names of particular districts from which those people migrated but not the villages themselves. Despite popular perception, most African migrants don’t actually leave the continent. Without even considering migration within individual countries, most international migration in Africa occurs from neighboring countries. Côte d’Ivoire alone hosts 1.3 million migrants from Burkina Faso, while nearly 600,000 Ivorians live in Burkina Faso. For some perspective, Burkina Faso’s population is estimated at nearly 20 million, with Côte d’Ivoire’s nearing 25 million. Countless articles in newspapers around the globe understandably discuss the migrant crisis in Europe, with Africans (and others) trying desperately to cross the Mediterranean in search of a better life. However, the more demographically significant migration of those within the continent remains understudied. But how to represent these migration in a way that transcends numbers? This is what I hope to do through CHI. Many of the people I spoke with migrated short distances, in some cases less than 10 miles. Are these individuals foreigners in their new countries? Are they considered international migrants? These are some of the questions I explore through my own research. While other aspects of African migration are worth of study, these more localized studies remain opaque for much of the public. Digital Humanities practitioners have the ability to bring these migrants into the public eye, and are also able to more easily share their research with the public in Africa. During my 4 years in West Africa, I was constantly reminded how much of academic knowledge is sealed off from the outside world through expensive journals and scholarly monographs. Graduate students and faculty at the University of Dakar would ask me if I had particular articles that they could not access. While more journals are open-access than in the past, much scholarly research still remains behind closed doors, inaccessible to those being written about. However, rural Africans are increasingly gaining access to the internet through smart phones and improved wireless infrastructure. Thus, if research can be made accessible online, it can be accessed by growing numbers of Africans, including those whose communities are the subject of academic scholarship.